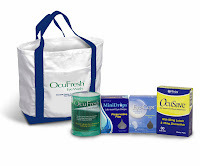 We received an OcuFresh package for review and loved the mini drops and the Eye Wash. The eye drops were helpful after a long night with little guy and a long day at work. They were easy to travel with because they are in individual droppers. Before I had a night meeting with an important client, I just used the eye drops and it really felt nourishing. We now have the eye wash on hand for when one of the kiddos needs their eye flushed. Hubby tried the vitamins for the long-term eye health. We enjoyed the informative packages and the nourishing eye drops! Want a chance to help with your family's health? Enter below for a chance to win the package we reviewed! I never needed eyewash until my baby was born and now my eyes seem to have all sorts of gunk in them, thanks to him poking me in the eye, sneezing in my eye, drooling in my eye - you get the picture! Eye wash is so much better than wiping it (where you're likely to get even more germs in your eye!). So I'd love to try these OcuFresh products! I would like to try this OcuFresh package! In the winter my eyes get so dry from running the heat and in the spring (coming someday to Michigan I hope!) my eyes always get irritated from the pollen and maybe these products would help!